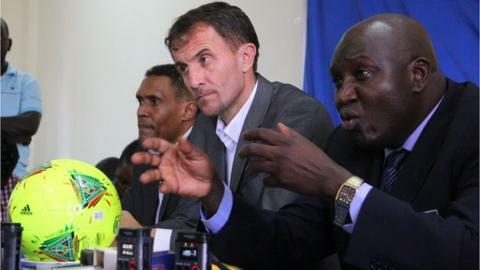 Uganda coach Milutin 'Micho' Sredojevic is "optimistic" his side will qualify for the 2015 Africa Cup of Nations finals in Morocco. The Cranes narrowly missed out on reaching the 2013 tournament, losing on penalties to Zambia in the final qualifier and Sredojevic is eager to "make Ugandans happy by qualifying" this time around. The Serbian, who took over the reins from Bobby Williamson in May 2013, will learn who his side will face in the second round of the preliminary qualifiers when the draw is made on Sunday in Cairo, Egypt. "Uganda last qualified for the Nations Cup in 1978 and it has been many years since. But we are optimistic that through our talent together with hard work, we can make it," Sredojevic told BBC Sport. "We are hoping for a good draw because that will give us a good start. But when you have to achieve in football, then there is no way you will avoid facing the best." Sredojevic is scheduled to name his squad on 30 April and would not be drawn on who he may include. "I believe in hard work and anybody who works hard and is disciplined will make the team," he added. However, it is expected that senior players such as Any Mwesigwa, Geoffrey Massa, Tony Mawejje, Emmanuel Okwi, Isaac Isinde and Dennis Onyango will all be given pivotal roles. The preliminary round games take place in July and August with the qualifying group matches running from September through to November.